On Wednesday 9 May, Chetham’s Saxophone Choir performed at The Bridgewater Hall, Manchester. Under the leadership of Andrew Wilson, the ensemble played to a near capacity audience in the Hall’s Little Bite Music series. The Saxophone Choir, which comprises of twelve saxophonists from across the school, performed a varied programme of works from the genre’s colourful repertoire. Highlights included some spectacular reworkings of Rossini, Bach and Strauss. Year 13 Saxophonist Daniel Poole featured as soloist in Nigel Wood’s Under the Veil, in a spellbinding performance on the soprano saxophone. Congratulations Daniel! Alongside a team of internationally renowned saxophonists, including Jim Muirhead, Carl Raven and Iain Dixon, Andrew Wilson guides Chetham’s saxophonists through a vast programme of solo and ensemble opportunities. Since graduating from the RNCM with first-class honours, Andrew has performed with many of the country’s leading orchestras including the Royal Liverpool Philharmonic, BBC Philharmonic and The Hallé. He is a former member of the Adelphi Saxophone Quartet, with whom he toured widely. Alongside his work at Chetham’s, Andrew’s other work includes tutoring for the National Children’s Orchestra, and at Huddersfield University, where he is currently the External Woodwind Assessor. The saxophone department at Chetham’s offers a broad range of learning and performing opportunities to all our saxophonists. The saxophone choir brings all the saxophonists together for a weekly rehearsal in which they enjoy learning music from the Baroque to present day including pieces written by the students themselves. All the players develop their versatility playing music of classical and jazz styles as well as gaining experience on the baritone, soprano and sopranino saxophones. 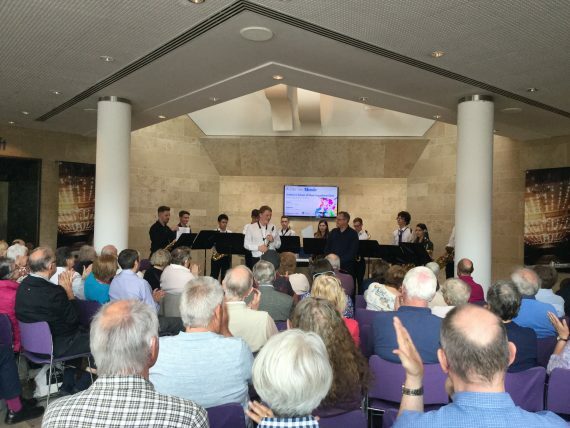 The saxophone choir continues to be a very popular ensemble and give many concerts both in and out of school and the highlight of this year was our lunch time concert at the Bridgewater Hall where we were warmly received for our Little Bite Music Concert. The audience were very appreciative and most complementary about the ensemble.